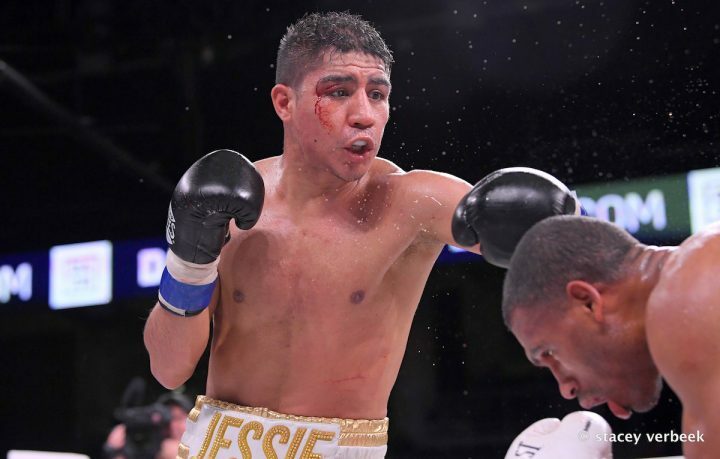 By Scott Gilfoid: Former two division world champion Jessie Vargas has reportedly accepted most of the terms for a fight against former IBF welterweight champion Kell Brook in April in the U.S, according to ESPN Deportes. Vargas (28-2-2, 10 KOs) is now only waiting for the 32-yer-old Brook (38-2, 26 KOs) to accept the fight. Vargas has already started training for the Brook fight with legendary trainer Freddie Roach in Los Angeles, California. Roach needs to work on Vargas’ stamina issues, because he’s gassed out in his last couple of fights and not looked good. If Vargas doesn’t get the fight with the soon to be 33-year-old Brook, then he’s offering to challenge World Boxing Organization junior middleweight champion Jaime Munguia (31-0, 26 KOs), who is expected to be back in the ring in two months on April 13 on DAZN at the Arena Monterrey, Monterrey, Mexico. Munguia, 22, still doesn’t have an opponent picked out for him yet by his promoters at Golden Boy Promotions. The main problem with Vargas getting a world title shot against Munguia is the fact that he hasn’t won a fight in 2 years, and he’s not ranked in the top 15 by the WBO at 154. Of course, these things can be changed overnight if the WBO has a meeting to vote Vargas into their top 15 at junior middleweight. But obviously look bad in giving Vargas a top 15 ranking at 154, given that he hasn’t won a fight in two years. It looks bad that Brook wants to fight a guy with a record like that, but it’s par for the course for him. I mean, his last two fights have been against Michael Zerafa and Sergey Rabchenko. That kind of tells you all you need to know about Brook and his ambition. Vargas makes it clear that he wants the Brook fight first and foremost, but if he can’t get that match, then he’ll take the fight with Munuguia if he can get it. Vargas says that Munguia’s team are willing to make the fight with him, but they want it to take place in September. Vargas needs a fight right now, as he’s been out of the ring for 4 months now. If he waits until September, Vargas will have been out of action for 11 months. That’s too much inactivity for the 29-year-old Vargas, who will be turning 30 in May. With Brook clearly not wanting to take any more chances of losing before his big cash out fight with Amir Khan later this year, he’s not about to take any risks by fighting one of the talented fighters at 147 or 154. Vargas is pretty much an easy mark. The 29-year-old Vargas is coming off back to back 12 round draws against Thomas Dulorme and Adrien ‘The Problem’ Broner in fights that many boxing fans felt that he should have lost. While Brook is busy fighting Vargas on April 6, Amir Khan (33-4, 20 KOs) will be challenging WBO welterweight champion Terence Crawford (34-0, 25 KOs) on April 20 on ESPN PPV at Madison Square Garden in New York. Obviously, there would appear to be a huge difference between the two fighters when it comes to the level of the opposition. While Khan is risking his hide fighting Crawford for good money in a fight that he’ll likely by a knockout, Brook is expected to fight a down in his luck Vargas, who has won only one fight in the last three years in beating journeyman Aaron Herrera by a 10 round unanimous decision in 2017. It’s been 2 years since Vargas last won a fight. Brook is choosing him to fight rather than a welterweight or preferably a junior middleweight, whose career is going well. You kind of have to wonder where Brook’s confidence level is at right about now after his poor showing against junior middleweight fringe contender Michael Zerafa last December. Brook took a lot of punishment in beating the 26-year-old Zerafa by an unimpressive 12 round unanimous decision on December 8 in Sheffield, England. What we learned from that fight is Brook lacks the talent to blow put fringe contenders at 154. Perhaps that’s why Brook is now looking to fight a welterweight fringe contender in Jessie Vargas rather than one of the talents at 154 or 147. It would be fair to say that Brook’s confidence level is at an all time low. Brook was stopped by former middleweight champion Gennady Golovkin in 2016, and then knocked out by Errol Spence Jr. in 2017. Brook has won his last two fights in beating Sergey Rabchenko and Zerafa, but those have been basically confidence booster level opposition, and not talented fighters. Brook has been trying to get the fight against Khan. The two were supposed to fight each other in April. That was the whole point in Matchroom Boxing promoter Eddie Hearn signing Khan to a 3-fight contract. He put him and Brook in two soft fights each against weak opposition to make them look good, and then they were supposed to fight each other in April. Khan used up his first two fights of his three-fight contract with Hearn beating Phil Lo Greco and Samuel Vargas. The third fight was supposed to be Brook, but instead Amir is facing Crawford on April 20. That’s a good fight, no doubt, but it’s not the one that Hearn wanted from Khan. As such, Hearn is going to sit back and hope like mad that Khan beats Crawford so that he can immediately put him in with Brook later this year for a mega-fight in the UK. If Khan gets blasted to smithereens by Crawford, like many boxing fans expect him to, Hearn is going to have a lot tougher job trying to sell the Khan-Brook fight to the British public. At the same time, if Brook loses to Vargas, which is quite possible, then that will hurt the Khan-Brook promotion as well. Even if Brook looks bad in beating Vargas, it could still hurt the promotion. Brook’s poor performance in beating fringe contender Michael Zerafa caused him to take a lot of criticism from his boxing fans, who clearly saw in that fight that Kell lacks the talent to compete with better fighters at 154. Zerafa is not one of the good fighters at 154, and yet Brook struggled with him for the entire fight. That’s why Brook is moving back down to 147 for his next fight. Considering how poor Brook looked against Zerafa, you can’t rule put the possibility of him losing to Vargas. If Brook is that worried about losing his next fight, maybe Hearn needs to check the scrapyard and try and find another lower level fighter for Kell to beat up on in a showcase fight so that he doesn’t lose his next fight. Brook is looking completely shot right now. His power is still there, but his reflexes, timing and defense has gone downhill. It could be the after effects from Brook’s two punishing losses to Errol Spence Jr. and Gennady Golovkin that we’re starting to see now.